We've been exploring the rivers and canyons surrounding Moab, Utah since 1961 as Western River Expeditions - pioneers in the river rafting industry. 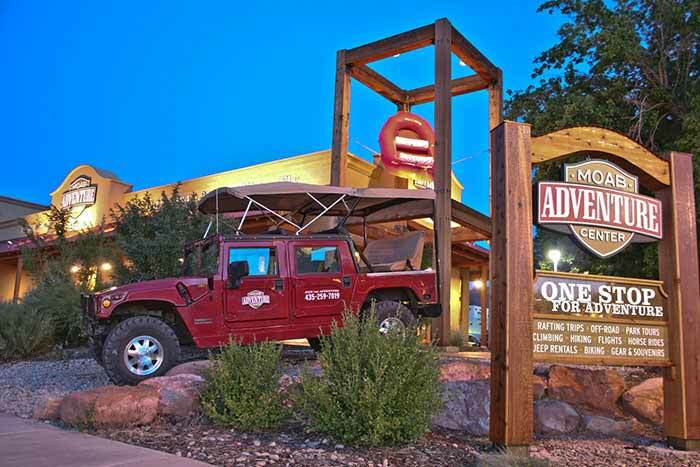 Western River created the Moab Adventure Center to give the "Adventure Capital of the West" its full due with a focus on day tours and adventures in unparalleled red rock beauty; and to become your convenient "One Stop for Adventure" in world famous Moab, Utah. Surrounded by an immense red rock playground, Moab, Utah is unlike any other place in the world. You'll feel like a kid again as you play in Moab's postcard-perfect desert adorned with giant sandstone formations, canyon mazes, and thousands of natural arches. You can explore several national and state parks just minutes from Moab, Utah. Find great accommodations with dozens of hotels in Moab, vacation rentals, ranch resorts, campgrounds and RV parks throughout Moab’s southwestern-style Main Street area. You'll experience the thrill of adventure every day with your choice of Moab river rafting trips, off-road hummer safaris, hiking in Arches National Park, guided tours, horseback riding,one-of-a-kind Moabmountain biking, and so much more! Visit the premiere Moab vacation provider, the Moab Adventure Center at 225 South Main Street in Moab, Utah or contact us for more information. Moab's One Stop for Adventure, the Moab Adventure Center, offers the easiest way to reserve any of Moab's abundant outdoor activities, bundle and save with any of our package vacations, and even gear up for your adventures with our retail store - all located conveniently in the shopping district of downtown Moab, Utah. Did we mention our reputation for having the most fun and best trained guides in the business?